Somehow we got all of this stuff to fit in our tiny car! After competing the Laugavegur trek, we caught a bus back from Þórsmörk to Reykjavík and spent an enjoyable day in the world’s most northerly capital city. We set up camp at the campground conveniently located just 2 kilometers from the city center and marveled at how busy it had become since our first experience there back in mid-June. An array of brightly-colored tents covered the campground’s three fields, making it feel like Reykjavík’s version of Occupy Iceland. A steady stream of campers was constantly making use of the amenities (kitchen, hot showers, wifi, etc. ), and there seemed to be a group of random travelers who chose to spend their time just hanging out in the common outdoor areas. We actually ran into several people that we had met at various times during our six weeks in Iceland—one even from as far back as our ferry to Flatey Island on day four of our trip—and figured that it was time for us to hit the road again. Before leaving, we spent our last night devouring some much-missed ethnic food, strolling around the pleasant downtown area, visiting some of the interesting outdoor sculptures and enjoying a pint or two of Iceland’s best microbrews at the aptly named Micro Bar. We both agreed that Reykjavík is a fun city to hang out in, especially after spending so much time in tiny villages. With only three days left in Iceland, we rented another car from SADCars and headed out on a short road trip. Our first stop was the Golden Circle, which is comprised of three different sites: Þingvellir National Park, Geysir and Gulfoss. All three destinations are located close together and are a mere ninety minutes from Reykjavík, making them a very popular excursion on the tourist circuit. In our rush to get to Látrabarg and see the puffins in their prime at the beginning of our trip, we had bypassed the Golden Circle, leaving what most people do first for last. Þingvellir National Park is located at the northern tip of Iceland’s largest lake and is of both natural and historical significance. Over 1000 years ago, this was the location where settlers from all over Iceland would convene for an AlÞing or Assembly every year. Here the island’s 36 chieftans would recite the laws governing the island and settle any disputes that had remained unresolved over the previous year, thus making it the location of one of the first democratic parliaments in modern history. Geologically, it sits right on the spot where the North American and Eurasian tectonic plates are currently ripping apart. 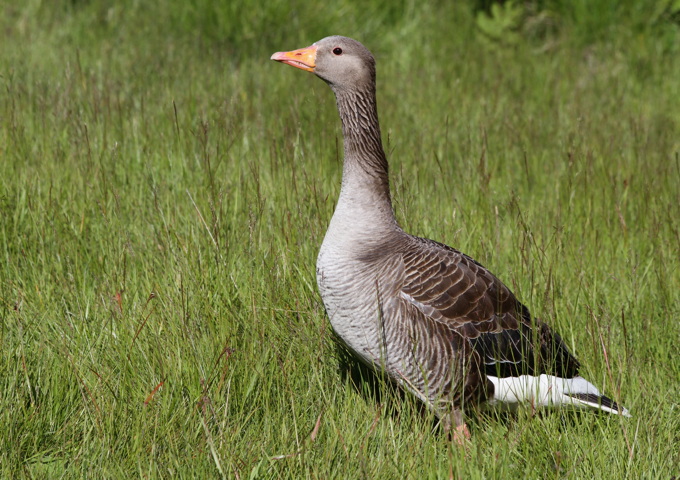 We took a leisurely stroll through the valley created by the on-going separation of the two plates, taking in an old church, a gaggle of pink-footed geese and some of the historic sites along the way. From there, we made our way to Geysir, yet another geothermal area made popular by the opportunity to see several geysers spouting off at regular intervals to the delight of all who watch. The word geyser is named after one particular geyser in this area (Icelandic for “gusher”) and is thus Iceland’s contribution to the English language. In its glory days, Geysir would blow up to 70 meters, but unfortunately ignorant tourists throwing rocks into its hole clogged it. Nowadays, it only erupts every now and then and not to the heights of its former glory. You have to be pretty lucky to see it, but it would be pretty spectacular to witness if the odds were in your favor. 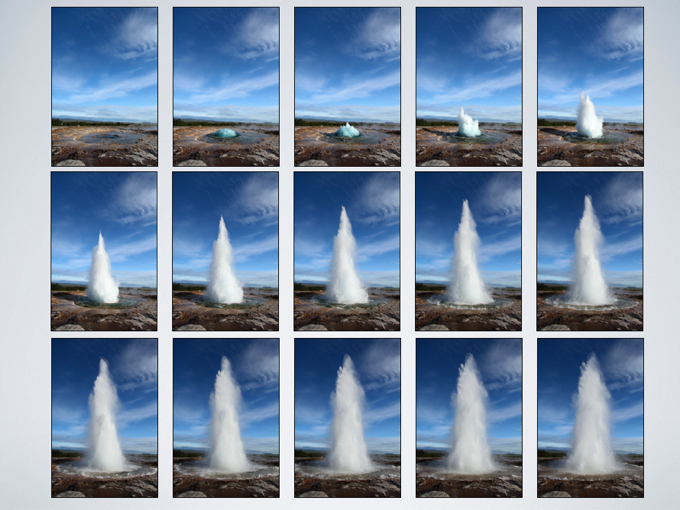 Luckily, there is a smaller geyser named Strokkur right next door that explodes every few minutes. We had fun setting up a tripod, putting our cameras into high speed shooting mode and capturing its eruption from beginning to end. It was really cool to watch the surface of the water in the hole pulsing up and down like an enormous jellyfish as the pressure from below ground built to the point of explosion. Although the area around the geyser was roped off for safety, you could get really close to it on one side. Every time it exploded up to 30 meters over our heads, it was hard not to worry that the boiling water was going to fall right back down on top of us. We used a wide-angle lens and set our cameras to high speed to capture Strokkur’s eruption. 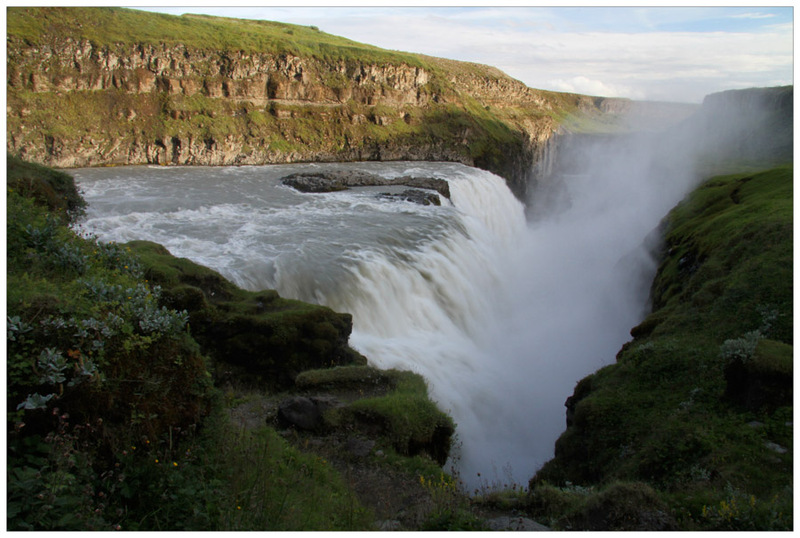 Gulfoss is a powerful double cascade that is certainly one of Iceland’s most impressive to see in person. We were amazed by the size and intensity of the falls but found it, like other large falls, to be a difficult subject to photograph. Sometimes it is best to put the camera down and just enjoy the view! 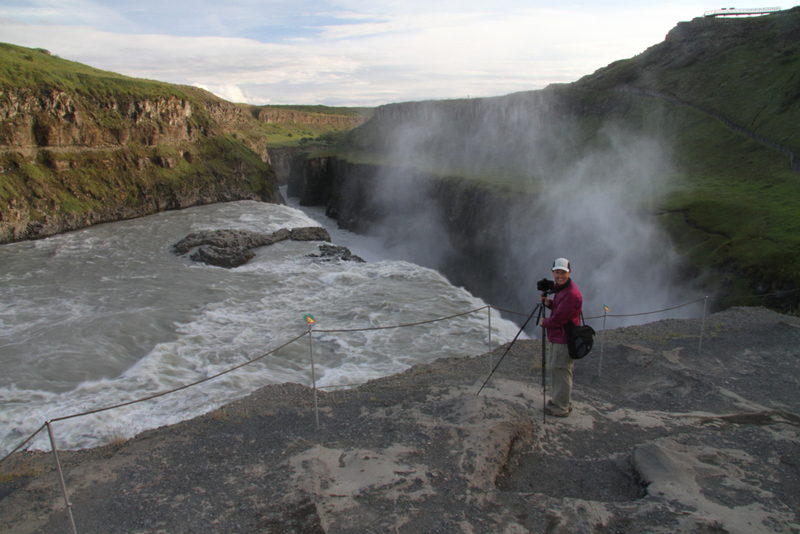 On Day Two of our final excursion, we drove north to see Hraunfossar, yet another of Iceland’s gorgeous waterfalls. Unfortunately, the weather wasn’t very cooperative for us. We headed south to Akranes, a small town just across the bay from Reykjavik with an enjoyable public pool and campground right on the water. With a campsite just a stone’s throw from the seashore we finally made good on our attempt to do some time-lapse photography and documented setting up our camp for the evening. After going through the same process for 39 days straight, we definitely had become pretty good at it, don’t you think? For our final day in Iceland, we planned an itinerary that would include a sampling of some of our favorite experiences in Iceland: hiking, waterfalls and a final hot pot. At over 180 meters tall, Glymer is Iceland’s official tallest waterfall, and it is located just about 100 kilometers north of Reykjavík. The short hike to see the falls was highly recommended by the very helpful host at the campground in Reykjavík, though he warned that it would be somewhat difficult. The five-kilometer round trip hike started out simple enough, but, after the first kilometer or so, we discovered what he meant. The trail dropped down into a river with a cool descent through a cave to the shore below. After scampering up the shore, the trail became much harder, and we happily used the available ropes to assist us up the steep and slippery terrain. As the trail leveled out, we were treated to views of Glymer, and we marveled at its sheer drop into the narrow moss-covered canyon below. Better views required more scrambling, but we eventually made our way to a close-up view and enjoyed a picnic lunch from a picturesque perch at the top of the sheer cliffs. The trail was a fun challenge and is a great hiking destination not too far from Reykjavík. With the remainder of the afternoon, we headed south past Reykjavík to Grindavik, the only town located on the southern shore of the Reykjanes peninsula. As we drove through the black lava fields, we dialed up the iPod and grooved to the sounds of Iceland’s newest hit band, Of Monsters and Men, the perfect soundtrack for our drive. Our flight the next day was departing just before noon from the international airport in Keflavik, which is about a 45-minute drive from Reykjavík. With the prospect of having to pack up our tent and bags, drive to the airport, return our rental car and catch a shuttle, we thought it would be a good idea to stay at Grindavik which is much closer to the airport. Lonely Planet described Grindavik’s recently renovated campground as being Iceland’s flashiest, and, with the added bonus of being located right next door to the famous Blue Lagoon, it seemed like an ideal destination for our final night. Whenever you check into a campground, the campground manager always asks what country you are from and writes it on your receipt. When we told the cute, young blonde Icelandic girl working that day that we were from the US, she wanted to know which state. We kidded that we came from the state of Chicago, and she told us that she would be heading there in a few weeks, explaining that her boyfriend was in a band that would be playing in Chicago for a few nights. It turns out that her boyfriend is actually the guitarist in Of Monsters and Men, the very band that we had just been listening to! She seemed quite pleased when we told her we were big fans. Too bad that they are out on tour now and that we will be in Colorado during their Lollapalooza appearance in Chicago. It would have been fun to see our favorite band of the summer in person. What better way to celebrate six fantastic weeks in Iceland than by taking a dip in the famous Blue Lagoon, another A-list attraction near Reykjavík. A few weeks back, we thought about taking a pass on it because it is so expensive. We had already visited the Nature Baths in Myvatn, and, at $50/person, we thought it might just be best to save our kronur and skip this prime tourist destination. On the other hand, we have enjoyed the hot bath experience in Iceland so much, it would be a shame to miss it. 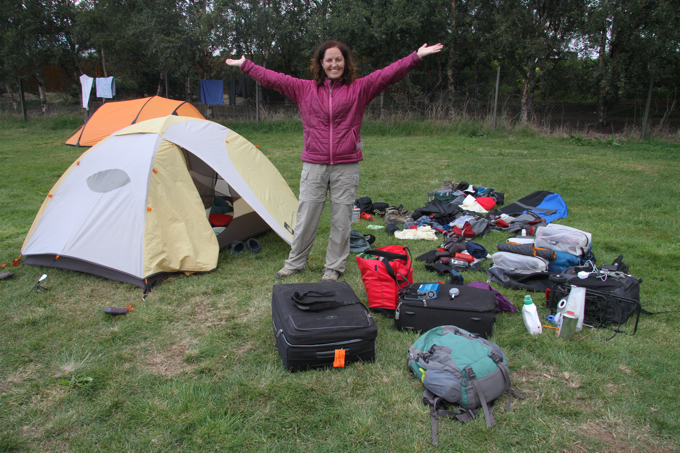 We have spent the last 40 nights in a tent after all; we deserved a little bit of luxury! We timed our visit for the end of the day so that we would miss most of the crowd. After paying the hefty admission fee, we entered the luxurious world of this Icelandic spa. The micro-chipped bracelets we were given at the front desk allowed us to open and lock our lockers with a quick swipe at a centralized scanner. After scrubbing down one final time in the super-modern showers with the complimentary mineral-enhanced shower gel and conditioner, we waded into the inviting turquoise-blue salt water of the lagoon and ordered a beer from the pool bar. Again, a swipe of our bracelets conveniently added our drinks to a tab that we would pay when we exited the lagoon for the day. As we sipped our cold beers, we took stock of the various amenities available in the lagoon making it a true spa experience. These included an invigorating waterfall massage, steam baths, hot saunas, and massage and beauty treatments that are available by appointment. Part of the lagoon experience is having a silica-mud facial which you apply yourself at the various mud stations by the water’s edge. With white-masked faces, we found a cozy, warm corner of the lagoon and toasted a fantastic summer trip to one of the most splendid countries that we have ever had the privilege of traveling in. Thank you Iceland for giving us an incredible experience and for making us want to return here again and again and again!